Our champ looks to stop the slow spin of the carousel. Can he do it? He’s in good shape heading into Final, with a category that, in theory, favors him over his female opponent. Charles should wager 4,800 to cover Jennifer. Jennifer can wager up to 1,000 to stay above Charles if they’re both wrong. Cyle is still alive, but must get it right, so all-in is the right play (with a minimum of 3,400). 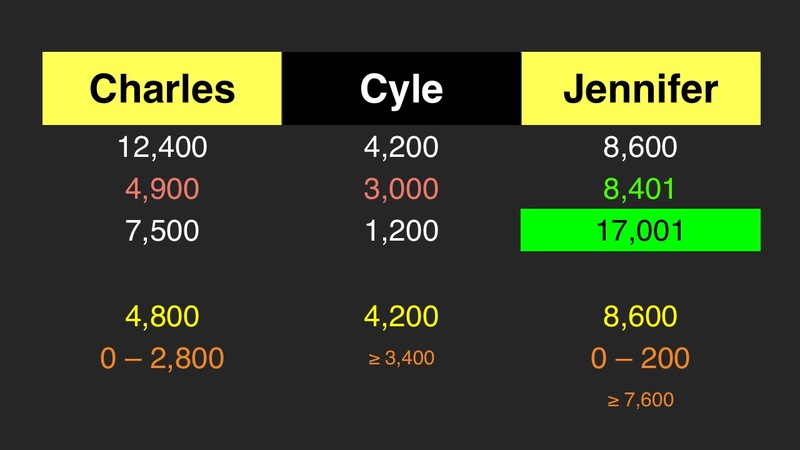 Since we expect Cyle to wager everything, Jennifer should cap her wager at 200 to stay above him. If Jennifer wagers 1,000, her total will be 9,600. In response, Charles might wager at most 2,800. Should he get it right with a smaller wager, Charles will have at most 15,200. In response, Jennifer should wager at least 6,600 – but all in is preferable. Jennifer should up her minimum “big” wager to 7,600 to take into account a Colbyesque wager out of Charles. How great is it that the only correct response on this sports clue was from a woman? (I didn’t get it, either.) A very impressive get by our new champ! Cyle, by not even playing for the win, earned himself the rare black wager. We’ll see you on Monday for the Tournament of Champions! there was a black wager on October 2, 2014. 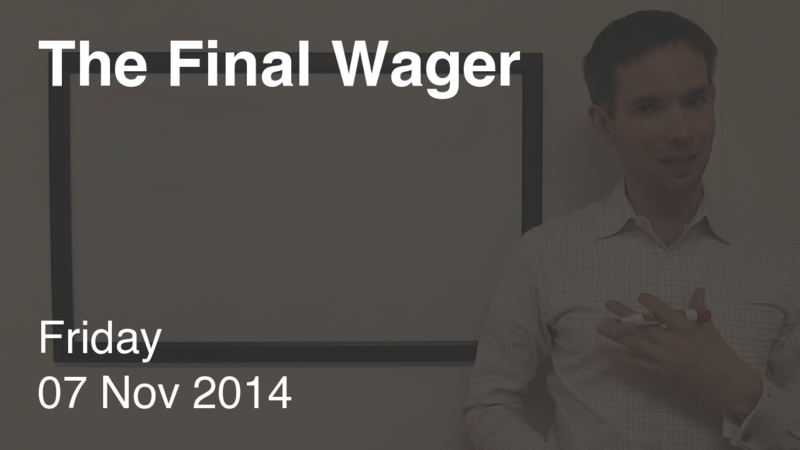 It is not on your list of black wagers. Thank you! Forgot to tag it. Answer should actually be New Orleans Saints. Question was asking for the team not the plant.